Rapid population growth in comparison with arable land will drive the global controlled release fertilizers market in the upcoming years. Steep population growth curve in the past five years from 6.90 billion in 2010 to 7.35 billion in 2015 along with rapid urbanization has decreased the portion of agricultural land per person. According to the Food and Agriculture Organization (FAO), global ratio of arable land dropped down to 0.197 hectares per person in 2013. As per WHO, global agricultural output needs to be increased by 50% per hectare in order to meet the food demand all over the globe. It will gradually shift focus towards good quality fertilizers to improve the soil properties and increase the land productivity. This positive trend is anticipated to have a beneficial impact on the total controlled release fertilizers market. Shortage of food crops and adverse climatic condition is shifting the focus of agriculturists towards sustainable agriculture, creating an impact on controlled release fertilizers market. Total malnourished population was estimated at over 800 million in 2015, of which close to 75% belong to rural areas and are completely dependent on farming for livelihood. By 2030, food demand is anticipated to increase by 35% and more than three-quarters of this demand is estimated to be met from increased productivity. Need of long lasting fertilizers to improve the fertility of the land and to enhance the crop yield will influence the controlled release fertilizers market substantially. High prices of the engineered fertilizers in comparison with conventional fertilizers such as urea and NPK fertilizers may act as a restraint for the controlled release fertilizers market growth in the upcoming years. The increased cost is on the account of special polymer coatings on the conventional fertilizer products. The products are not popularized in economically developing and under-developed countries due to the high costs. Also, farmers of these region are not aware of the benefits of the products owing to availability of low cost conventional fertilizers. Global controlled release fertilizers market is categorized into polymer coated NPK, polymer sulfur coated urea or sulfur coated urea, polymer coated urea. Sulfur coated urea and polymer sulfur coated urea fertilizers will hold sway the overall controlled release fertilizers market and accounted for over 40% of the global share in 2015. Sulfur coated urea are essentially urea granules coated with liquid sulfur to maintain coating uniformity of each granule. It contains around 35% nitrogen and 15% to 20% sulfur. Polymer sulfur coated urea coated with 1% polymer after the urea granules are coated with sulfur. This segment registered a revenue of over USD 1 billion in 2015 and it is forecast to cross USD 1.75 billion by 2024, growing at more than 6% CAGR. Market size of polymer coated urea was estimated at more than USD 600 million in 2015, which accounted for over a quarter of the overall controlled release fertilizers market share. These fertilizers improve the nitrogen absorption efficiency and reduce loss of nitrogen to the environment. Its ability to maintain the nutrient quality of the soil throughout the harvest season is going to boost the controlled release fertilizers market growth. This segment of controlled release fertilizers market will have a healthy growth at over 5% throughout the forecast timeframe. On the basis of crops where the controlled release fertilizers are applied, controlled release fertilizers market has been segmented into cereals & grains, fruits & vegetables, oilseeds & pulses, and other crops such as turfs, ornamental plants, and other gardening plants. Global cereals and grains demand as the primary food source makes it a noteworthy segment with close to 40% of the market share. In 2015, cereals and grains generated revenue more than USD 900 million in controlled release fertilizers market and is likely to grow at more than 6% up to 2024. Escalating lawn and garden consumable market in the developing countries of Asia Pacific will provide an opportunity for global controlled release fertilizers market growth in the next few years. Enhancing lifestyle coupled with growing awareness about gardening and landscaping will act as a catalyst to the market growth. Hobby cultivators and gardeners will also enhance demand. Asia Pacific accounted for almost half the overall controlled release fertilizers market share in 2015. This growth is on the account of huge agricultural land coupled with increasing awareness about sustainable cultivation to meet the growing food demand. Asia Pacific market generated a revenue more than USD 1 billion in 2015 and will grow at a high CAGR of over 7% throughout the forecast timespan. Europe will have a sluggish growth at less than 2% CAGR as conventional fertilizers and accounts for a large share of the global controlled release fertilizers market. The region registered more than USD 170 million in 2015, accounting to a little over 7% of industry share. 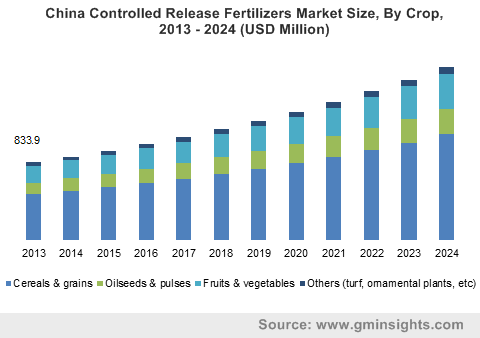 Global controlled release fertilizers market has an intense competition with various strategic decisions, mergers, acquisitions, and partnerships by the market participants. Key market players include Yara International, Greenfeed Agro, Agrium, Inc., Israel Chemicals, Haifa Chemicals, Scotts Miracle-Gro, ICL Specialty Fertilizers, Kingenta, and several other chemical and agricultural product companies. Strategic partnerships between companies such as Compo GmbH and BASF SE characterize the controlled release fibers market competitive landscape. Companies have also developed software and applications to enhance crop quality and maintain their hold on the market. Haifa Chemicals, for instance, has introduced Haifa NutriNet, FloraMatch, FoliMatch, and several other software to provide expert advice to farmers all over the world as well as to expand their customer base. Controlled release fertilizers are specially designed fertilizers which are coated in order to provide a long-term effect on the soil. Escalating population growth and increasing food demand has urged the requirement for improving the regular crop yield. With increasing demand for better land productivity, many farmers and agriculturists are gradually shifting their focus towards these eco-friendly fertilizers, thus helping the controlled release fertilizers market. Asia Pacific has the highest demand and is also forecast to be the fastest growing market owing to developments in farming methodologies in agriculture based countries such as India and China. Though high priced, controlled release fertilizers market growth is expected to be characterized by higher product efficiency.